Yesterday Mark Herzlich announced that he was diagnosed with Ewing’s Sarcoma, a form of bone cancer. Today we find out some more information. and I will make sure it gets to them. 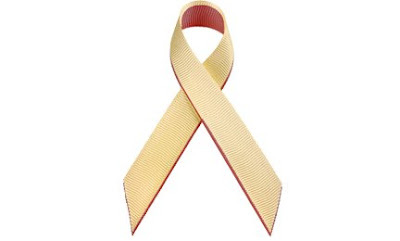 What do you think about the Herzlich ribbon? I’m thinking about Mark all the time! Where can I get one of those Ribbons? We are in the process of creating ribbons and bracelets for Mark Herzlich that will become available on HerzNation.com in the coming weeks. We are all shocked by this news and thus a little unprepared. Thanks for your support. I am writing a manuscript to promote awareness of adolescent and young adult cancer. On April 16, 2009 I spoke with a Boston Medical Oncologist and Pediatric Oncologist as she had diagnosed my son’s cancer in his femur as Ewing’s Sarcoma–Jeff, an all star hockey and baseball player (18 yrs old). Several questions included “any new drugs for Ewing’s? “There are many new drugs for sarcomas, she said….still in testing…IGFR Receptor Inhibitor, probably useful in 20% of Ewing’s cases. “Athlete’s and Ewing’s, any connection?” I also asked her. John, BC goalie and good friend of Jeff has Jeff’s #12 on the side of his helmet as Jeff was his defensemen on the Metro Boston Select Team they played on before college. Boston Bruins became a huge support/part of his battle, Bruins PMC Team’s 4th year riding for Jeff. GOOD LUCK MARK! YOU’RE GOING TO BE ALRIGHT! I am at mid field in completing my book and will pray and follow your case with hope and pride in all that I’ve seen and read of you……. This is my tenth year as a Ewing's Sarcoma survivor. I had all the treatments including an autologous stem cell transplant. I wish Mark all the best in this personal challenge that has fallen upon him. Mark, my husband was just diagnosed with Ewing's Sarcoma,in soft tissue, at 51, we have just finished the 2nd cycle of chemo. Doctors say he has at least 8 months of chemo then hopefully the tumor has shrunk enough to operate. We live in Roanoke,VA & saw the bc game against VT…so happy the Hokies raised the money for research. We would love to correspond with you. We know this disease can be beaten God willing.